Polycultures are groups of plants and organisms that occupy a specific ecological niche. The environmental conditions in a specific location are often defined by the abiotic or nonliving components of that space. Sunlight, water, temperature, soil type, and minerals are the abiotic components of a site. Within this space certain plants and organisms thrive since they are adapted to the conditions. Nature does not like empty space that can be otherwise productive. “Pioneer” plants will be the first to occupy barren or disturbed land since their seeds can germinate in harsh conditions. Most pioneer plants have tap roots, long vertical roots that dig deep into the soil to find moisture and nutrients. These plants begin the long and progressive increase in organic matter and ecological services provided within the niche. As soon as any plant appears, the niche changes slightly becoming more suitable for other plants. Along with the first plant, animals may appear, using the plant for food or shelter, and leaving behind their manure. Although slight and highly localized, the manure changes the availability of nutrients. In a season or two the niche is filled with plants. Early pioneer plants may even have been replaced with other species as the soil changes. The covered soils retain moisture and increase seed bank germination. As more and more plants emerge, competition for resources begins and a balance between all members of the niche must be reached. The niche becomes balanced as the required ecological functions are met and the role of each plant is refined in the polyculture. A succession of plants will occupy the space over time. Not every seed that germinates or plant that grows will find the necessary conditions for its survival. In nature, certain species of plants are commonly found growing together. These are called "Natural Associates" and have been documented as groups of plants that commonly appear in close proximity. Polycultures, are plant guilds that designers create. After assessing the site conditions and available ecological services, a polyculture designer will select the plants that are suitable for the niche. In the process the designer will also make sure that all the ecological services required for the success of the polyculture are delivered by the selected plants. The ultimate goal of the polyculture is to increase the ecological services available to all the plants while building organic material, water holding capacity, and the natural capital of the niche. A successful polyculture of plants meets all the ecological functions necessary to make it self-supporting. Like a forest that needs little other than water and sunlight, a polyculture is a beneficial and self-sufficient assemblage of plants. 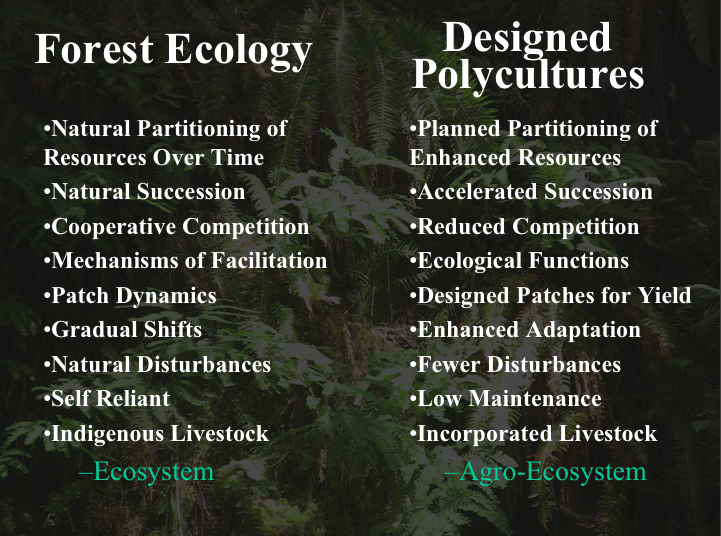 Polycultures are easily assembled using the natural capital plant database. The goal is to fill the space with a diversity of plants that deliver ecological services to the niche and human uses at harvest. Define the site conditions, the niche. Using the search page, define the site conditions and choose plants from the list that meets the needs. Details on how to do this are on the "how to..." page. The strategy is to fill the space vertically and horizontally with plants so that all get the required sunlight. Facing south the tallest are in the back, shortest in front. This is the beginnings of the 7 layer forest garden. Start your searches by building the structure of your planting area using your tallest plants as the canopy. In most cases, this is the tall trees. Search for these first using the parameters of your site and download the list into Excel. Then search for your shorter partial shade tolerant trees, followed by the shrubs, perennials, grasses, and vines. These can then be sorted and grouped by type in a single spreadsheet. Once you have all the available plants listed, begin looking for the ecological services they provide and build the layers of your forest garden using plants that will support it. Add a column on the left and start making your selections, a simple 'X' will do. Once you have found all the plants that you need of the different types, resort the spreadsheet by your selection column and then by type. If you want to add a third sort parameter, use height. From this final sorted list you can begin to draw and plan your forest garden. Put in the tall canopy trees first and then work down your list. If you run into a problem, send us your list and we will help you get started.